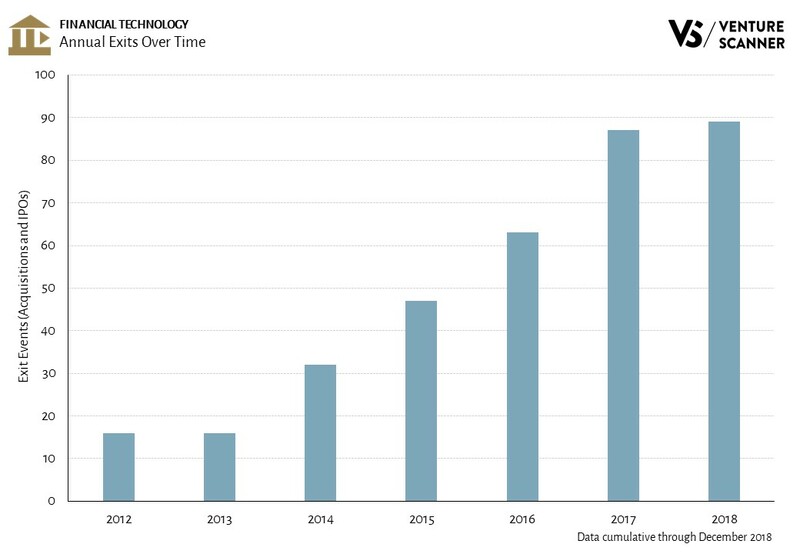 Now that 2018 is complete, let’s see how exit activity for financial technology (fintech) compares to previous years. The graphic below shows the total annual fintech exit events over time. 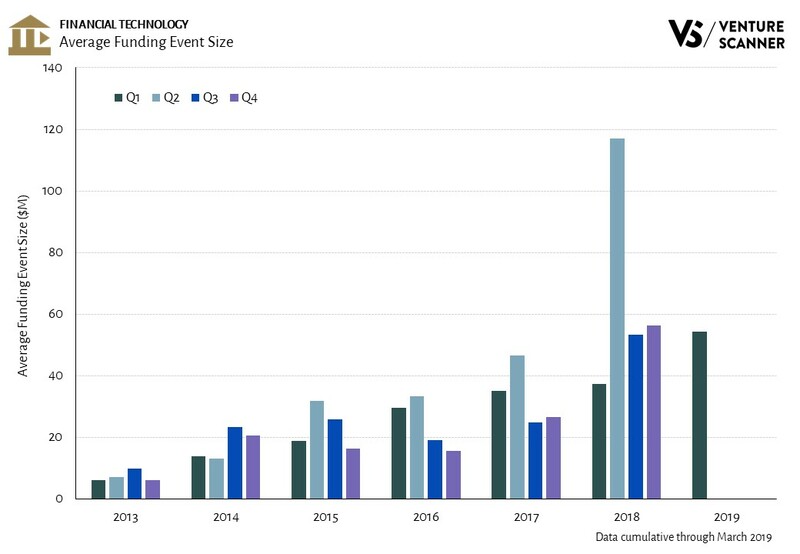 As the graphic demonstrates, fintech exit activity had the highest year on record in 2018 with 89 exit events. It represents a 2% increase from the previous year’s exit activity. In addition, fintech exit activity grew at a CAGR of 41% over the past 5 years. It’ll be interesting to see if its exit activity will drop in 2019 or reach even higher levels. The fintech industry has seen $125B in total all time funding. 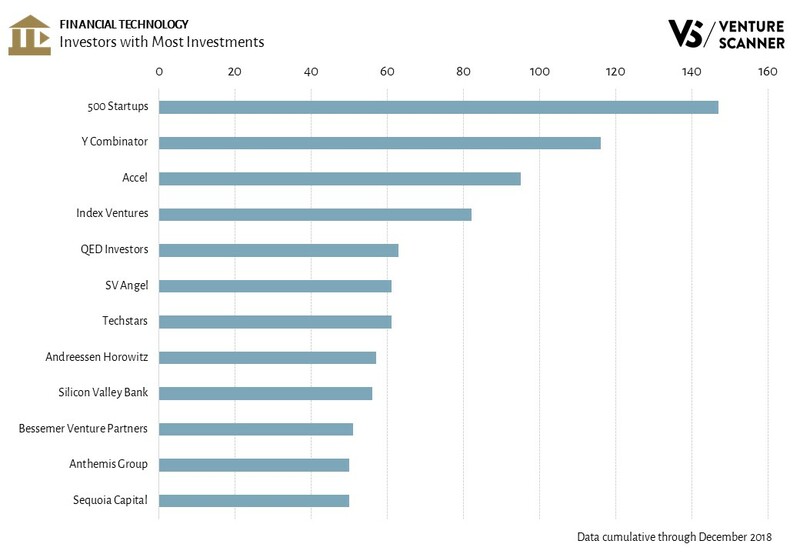 Let’s analyze the investors making bets into fintech and identify the most active firms. As the graphic demonstrates, 500 Startups has made the most bets in the fintech sector with 147 investments. Y Combinator follows in second place with 116 investments. Examples of companies 500 Startups invested in include Credit Karma, Finova Financial, First Circle, and Albert. It’s interesting to note that Silicon Valley Bank is on this list, as sometimes it operates as a corporate investor in this space. Let’s see which investors make their way onto this list over the next year! Consumer Lending companies offer new ways for consumers to obtain personal loans and have credit risks assessed. They include peer-to-peer lending, micro-financing, big data analytics, and consumer credit scoring services. Some example companies are SoFi, CommonBond, Avant, and Lufax. Let’s now investigate how the fintech categories’ funding compare with each other historically. 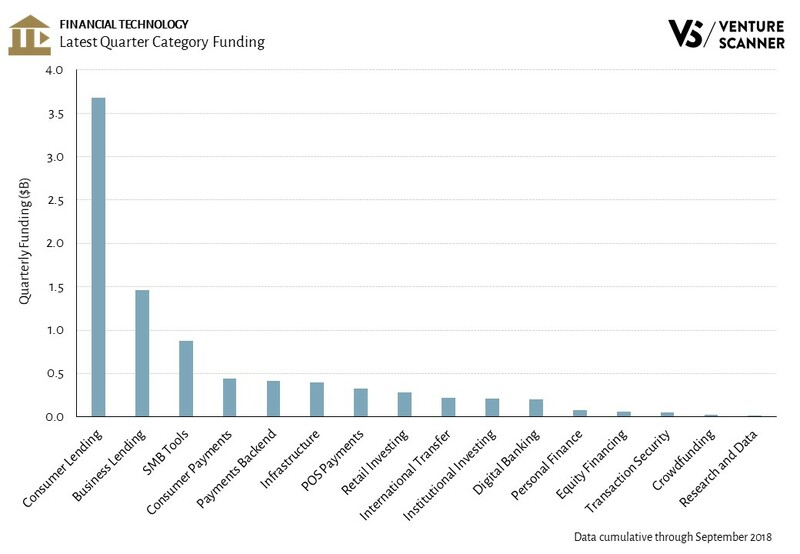 The graph below shows the all-time funding for different financial technology categories. The Q3 funding and growth rates of these categories are also highlighted. As the bar graph indicates, the Consumer Lending category also leads financial technology in total funding at $33B. Payments Backend and Consumer Payments follow in the second and third place spots with $28B and $27B in total funding, respectively. 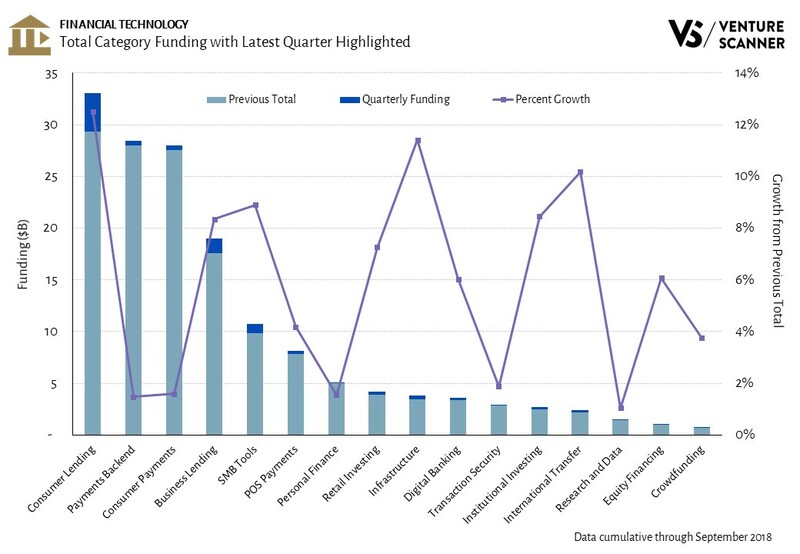 In summary, the Consumer Lending category is leading the fintech sector in both Q3 funding and all-time funding. Let’s see how the the rest of 2018 shapes up for financial technology! 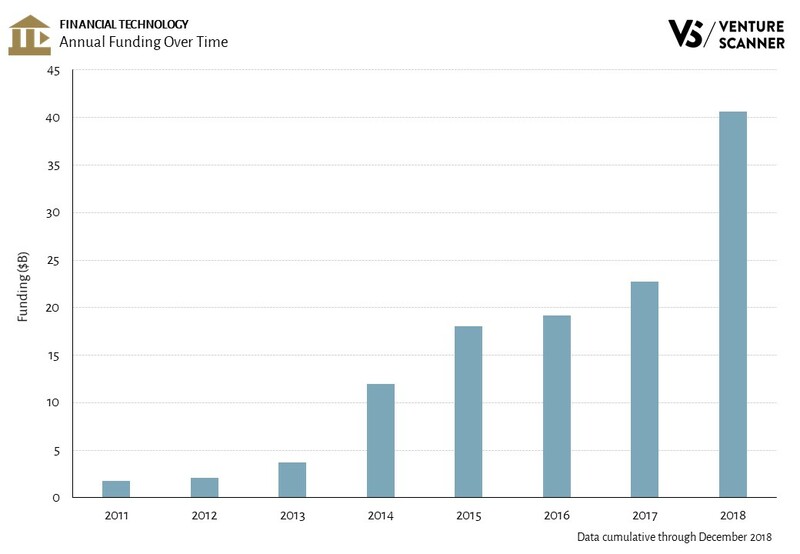 To learn more about our complete financial technology report and research platform, visit us at www.venturescanner.com or contact us at info@venturescanner.com.